The NX-411 is Kenwood's newest 900MHz radio which has much more advanced features than its predecessors; the TK-481 and TK-431. With the advent of the NX-411 the need to have a compact package with many features meant that the internals of the radio must be very small in size. One of those small internals in the radio is the receive filters. The NX-411 receiver front end consists of 2 bandpass filters; L820 and L830 with Q804, an LNA (BB505CES-TL-E), located in between both bandpass filters. L820 and L830 are bandpass filters centered at 938MHz and with a bandwidth of 6MHz (+/- 3MHz). Since L820 and L830 are SAW filters they are very small in nature which means that for all practical purposes its not feasible to change these filters out for ones centered at 915MHz. Since the NX-411 was designed to receive from 935 to 941MHz the question arose; how well do the existing filters in the NX-411 perform at 927MHz? 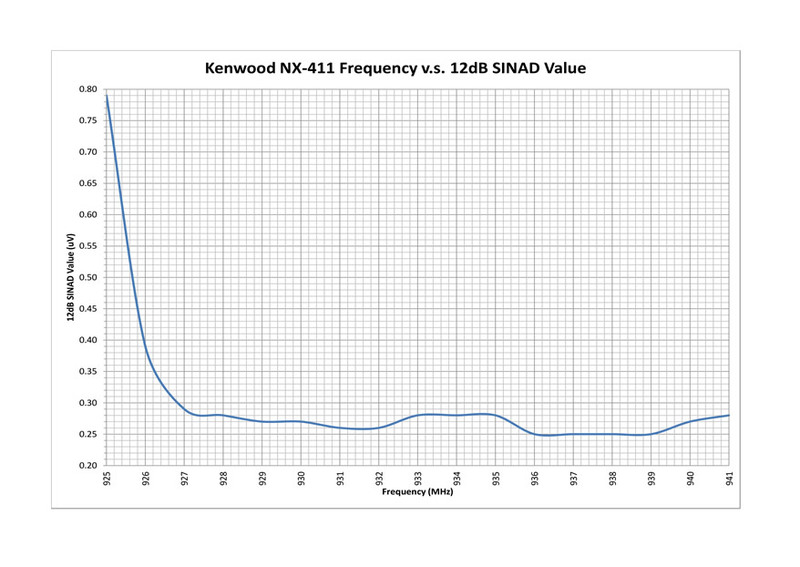 I performed a SINAD test on two NX-411's as an indicator of how well the receiver works at 927MHz and plotted the results, it is by NO means meant to be a plot of filter function or performance but rather it gives us an idea of how well the NX-411 receiver in general works at 927MHz. I started the SINAD test at 941MHz and went down in frequency in increments of 1MHz stopping at 925MHz. What we can see when we plot the receiver performance is that from 935 to 941MHz we have a band pass (as expected) with skirts slightly rising at 935 and 941MHz. We can then see that the performance again flattens out more or less from 927 to 932MHz. We then see that the NX-411 receive performance drops off sharply below 926.8MHz- these tests were performed on 2 radios and they were both about the same so I would expect this chart to be somewhat indicative of the NX-411 as a whole. 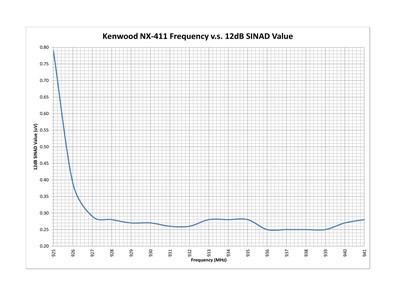 What I discovered in performing a SINAD test of the receiver is that the NX-411 works just fine at 927MHz with a value of 0.29uV for 12 dB SINAD. We are not going to be doing weak signal work with a handheld and 0.29uV is just great for a radio such as this!